The Iranian man has been served with a deportation order. 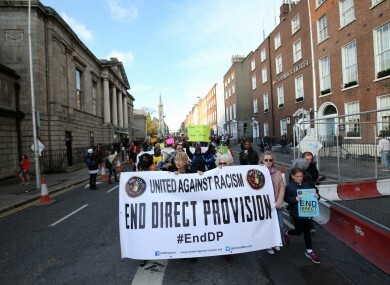 Protesters calling for the end of Direct Provision. AN IRANIAN MAN is entering his 35th day on hunger strike in a Sligo hotel serving as a direct provision centre. Amjad Rosstami is in the Globe House in Sligo town and is subject to a deportation order having seen his application for asylum rejected as he had landed in the UK before coming here. Under EU law, asylum must be processed in the country of first landing. Local TD Marc MacSharry told TheJournal.ie today that he had met with Justice Minister Frances Fitzgerald about the case last week. He said she was aware of the issue and that an oral hearing on the case is planned. However, he said he had not been allowed see Rosstami in the centre and its owners had referred him to the Reception and Integration Agency (RIA). “Frances Fitzgerald says the issue will be looked into, but time is pushing on. The whole Direct Provision thing is a disgrace. Surely there’s a better way? To have people cooped up is wrong. A widely shared Facebook post yesterday highlighted the case, calling it “reality in Ireland”. A statement from the Department of Justice says that they cannot comment on the case. “The department does not make any comment on any particular individual who is in the protection process. The State has a solemn obligation to protect the identity of those in the protection process as set out in Section 19(1) of the Refugee Act 1996 (as amended). Around 5,000 people are in direct provision centres in Ireland. Email “Asylum seeker enters 35th day of hunger strike in Sligo centre”. Feedback on “Asylum seeker enters 35th day of hunger strike in Sligo centre”.